The picturesque mountain retreat of Kuranda Village is just 25km northwest of Cairns in Far North Queensland, Australia and is surrounded by World Heritage Rainforest. Visitors can travel on Kuranda’s Historic Scenic Railway or by car or bus, via the spectacular Kuranda Range Road or over the rainforest on Skyrail Rainforest Cableway. Kuranda has come a long way from its initial origins as a centre for those choosing an alternative lifestyle in the late 60’s. Historic Buildings from the villages past now house a variety of upmarket restaurants, cafes and bars. It is still laid back, but with a style and sophistication that sets it apart from other Cairns Highlands. 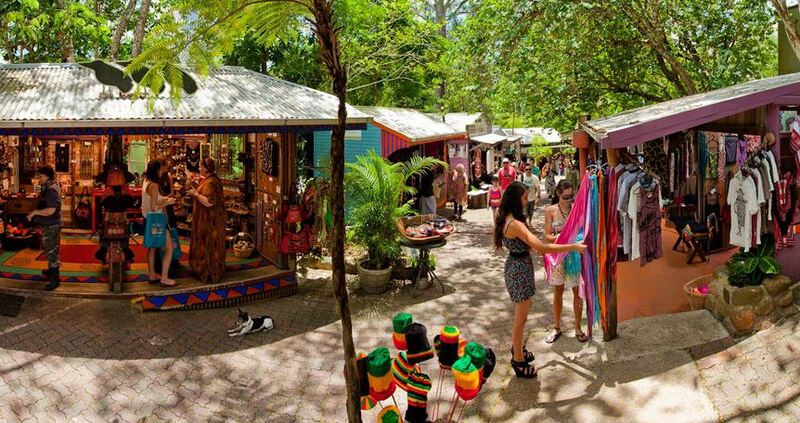 Kuranda’s shops and markets with their exotically handcrafted goods, Aboriginal artefacts, restaurants and coffee shops make Kuranda a well-known day destination, but to truly enjoy the ambience this village has to offer you really have to stay a few nights. Whether you are looking for a cosy bed and breakfast, a well maintained multi-choice accommodation and camping park, a hotel that when you step inside you feel like you are back in the 1920’s, a gorgeous resort or a backpackers hostel, you’ll find it in Kuranda. Take the time to visit some of Kuranda’s many first class nature based tourist attractions, which include koalas, butterflies, native and exotic birds, kangaroos and reptiles. Don’t miss the famous Barron Falls, which are breathtaking. You can also see traditional Aboriginal dancers perform, travel on a riverboat on the mighty Barron River or join an Army Duck ride through the rainforest.